So Which Holster is Best? What makes any holster a good holster? The definition of a good holster is one which lets you draw, aim, and fire as quickly as possible. That, and only that, is what makes a holster good. It could be made of leather, gold, or paper mache – if you are to respond quickly and efficiently, go for it. A gun holster is a very personal accessory. There are many holsters for the glock 17 to choose from, which is unsurprising considering that the glock 17 itself has been around for decades. How will you choose to carry your Glock? As you already know from our Glock 17 Gen 4 review, this particular gun came into this world already a winner. It was invented by Gaston Glock, a man who had no prior experience with firearms. 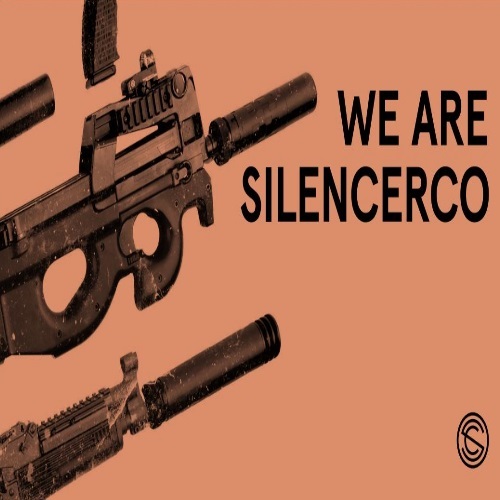 The gun was created as a candidate for the official sidearm of Austrian military and police. In 1982, Austrian armed forces began using the Glock 17, and soon after that other European countries showed interest in the firearm. Glock’s popularity increased and reached such proportions that it can be considered one of the most sought-after guns in the world. Some accessories you can do without. After all, not everyone needs to have a folding shoulder stock – an accessory which turns your semi-automatic handgun into a short-barreled rifle, which requires a special permit for carrying it in the United States. Other accessories, however, are essential. The top glock accessory, one which a gun owner can’t really live without, is the holster. Holsters aren’t your run-of-the-mill accessory. Far from it. They are a big part of being a gun owner, and this is even truer for those who are using their gun as a service sidearm. A shooter needs to have confidence in his gun. The Glock 17 is one of the most reliable weapons in the world, and the holster in which you choose to house that weapon is of great importance and significance. You could be the owner of the greatest pistol in the world, but if you are unable to draw and fire, then it really doesn’t matter. Guns are sold for the purpose of self-defense, so what good is buying a gun if you are unable to defend yourself when the time comes? Holsters, whether for the Glock or not, come in many shapes and sizes. They differ by material as well as usage. They differ by their ability to conceal a weapon or not. Finding the right holster can be a hassle. Sometimes, it takes a person several tries before he or she find the holster which is meant for them and their wants and needs. So, what does this all mean? Well, it means that there is NO such thing as the “best holster”. People choose according to different factors. 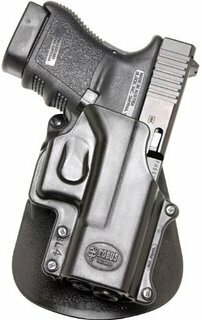 What may be the ultimate Glock 17 Gen 4 holster for one user, could be a big letdown for another. In spite of this, there are several holsters which have been consistently worn, used, and praised by their wearers. This is a list of the top 5 Glock 17 holsters. They are arranged in no particular order. This is an OWB holster, which has proven itself countless times and has gained immense popularity with gun owners. 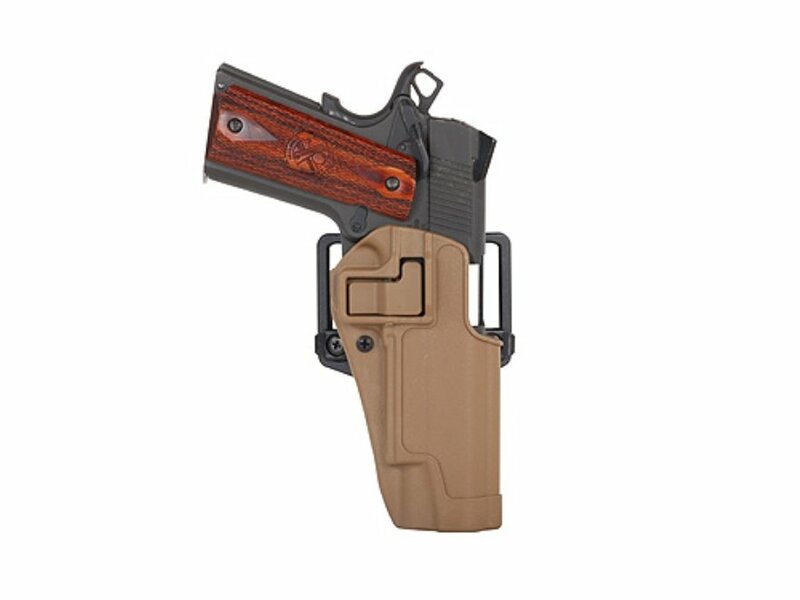 The holster has a quick draw, but what makes it unique is its release button. This button helps shooters keep their finger on the outside area of the trigger guard as they are drawing. This is the correct way to hold a gun, until such time as a target is acquired and the trigger is pulled. This holster is highly adjustable and very versatile, and it is why so many shooters choose to use it. This holster comes with the belt loop option or the paddle option, and it is made with a carbon fiber polymer. Because of the polymer composition, it is extremely resilient, and can take a lot of punishment and perform magnificently, even under harsh conditions of heat or cold. The paddle and belt loop are attachments, but the holster itself is made from a one-piece polymer mold. This means that the holster has absolutely no attachment points, and because of that there is a lot less chance of something going wrong, and of parts coming off or needing replacement, etc. The retention screw, which is next to the locking system, can be used to adjust the tension of the lock. The locking system rests on the inside of the pistol’s trigger guard. The tighter the screw, the more pressure you will have to put on the release button in order to draw the gun. This main advantage of this holster is that it is thumb-activated. Much like the Blackhawk, it has a locking system. The holster’s automated locking system (ALS) makes sure that your gun is secure, and drawing is achieved by releasing a thumb break. This is a vast difference, when compared to the Blackhawk which utilizes the trigger finger to draw. With both holsters, drawing is done in a very natural kind of motion. However, use of the thumb, rather than the trigger finger, is an approach which might suit some people more than the Blackhawk. As for fitting, it gets very close to the body, and it sits very snug. There is a belt slide option, as well as a paddle option. This holster is made with high-density plastics, meaning that you don’t have to maintain this holster. Obviously, you should keep it clean, but there no need to oil it, or to let it breath or sweat (like with a leather holster), and the cleaning can be done with soap and water. The paddle version lets the wearer remove the holster, without removing the belt. The retention on this holster is very good, and – much like the SERPA and 6378 – it provides an audible click so you know your gun is secure. This holster has great retention, and the adjustment screw allows the wearer to tighten or loosen the holster’s grip. The paddle is very comfortable, and once you get used to wearing it, it becomes a part of your body. It does not feel out of place or bothersome. It uses a softer kind of plastic where the holster is in contact with the body. If you own a Glock 17, this can be the perfect holster for you. It is so comfortable, and comes so highly recommended by those who use it, that you can go ahead and order it online, without worrying about whether or not it will fit. It is molded perfectly, and it will also fit the Glock 22/23/19 models. 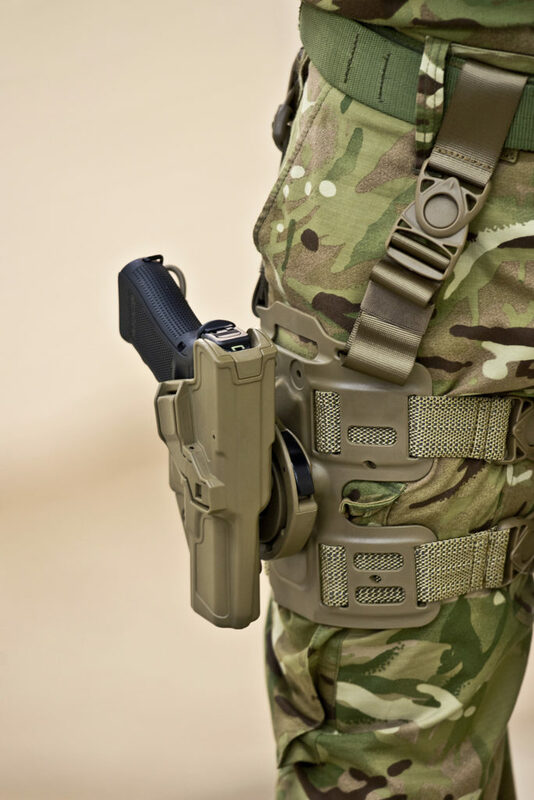 This holster is made by Glock, for Glock weapons. It is ideal for concealment, but bear in mind that the 17 is a full size gun. It isn’t too bulky, and there are no levers or buttons which may get caught in any clothing. The sport combat holster is made of polymer-2, the same substance that makes up a lot of the Glock 17 itself. It is lightweight and extremely durable, and it fits left- and right-handed shooters. This holster is compatible with all 9mm, .40, and .357 caliber Glocks. Glock also makes sport combat holsters for other calibers. The holster covers the trigger guard, and it sits high and tight. It makes sure that the gun is always at the ready, and that it doesn’t move around. It is a very solid holster, made by Glock for Glock. This is one of the cheaper holsters out there, priced normally at ~$13, but it is by no means cheaply made. The Glock company is known for its superior craftsmanship, and just because something costs significantly less, doesn’t make it any less valuable. This is an inside the waistband (IWB) holster, which is made of kydex and leather and is highly adjustable. It has removable belt clips, which can be moved up and down to better suit the wearer. The back of this holster has a nice finish, and it is smooth and comfortable. The holster comes with not that much retention. It relies on the body to provide the retention, and it achieves this easily. Unlike other holsters, there is nothing physically locking the gun into place, but there is never any issue with the retention. It won’t accidentally fall out or lose its place. It is a reliable and popular holster. But, for those who need to have it juuust right – the leather/kydex makeup allows the holster to be adjusted even further, by using a blow-dryer or heat gun. This way, wearers can manipulate the holster and get to a personalized, perfect fit. When it comes to concealed carry, comfort is important as almost nothing else. If you are looking for an IWB option that will feel good against the skin, be easy to use, and very accessible and affordable – Galco’s King Tuk is definitely worth looking into. In our modern age firearm companies have focused on making guns that are more and more compact. Many states allow for open carry or conceal to carry your weapon. These laws allow you to carry a pistol on your person. In the states where conceal to carry is permitted the need for a more compact gun is extremely important. These concealed guns have to sit on the hip or pocket of the carrier. Not to mention they have to be concealable. Weight and size becomes a huge factor when you are carrying a gun around all day. This is why finding the right holster is key. This is also the reason why Glock has focused their energies to creating handguns that are lighter and more compact. I want to take a moment to do a brief overview of some of my favorites. 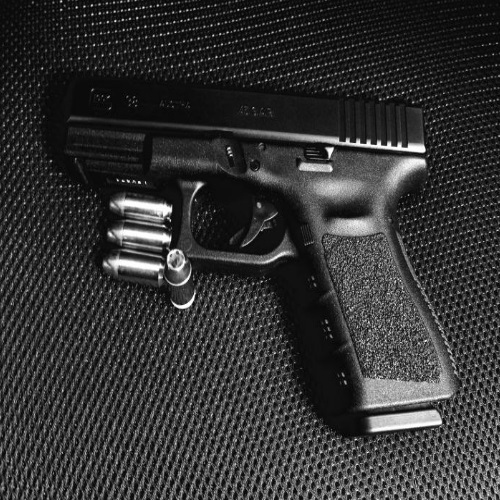 The Glock 36 is the slimmer compact version of the Glock 37. This gun is small! It is also one of the lightest Glocks on the market weighing in at 27 ounces loaded. You can carry it around all day without too much strain on your hip. It’s 6.96 inches long x 4.76 inches high dimensions make it easy to conceal. This gun carries .45 caliber rounds which means that although this gun is small it is mighty. The oldy but goody. Everyone knows about the Glock 19. This is a classic handgun which still a standard for CCW and open carriers alike. The 4th generation offers better comfort with it’s textured grip and adjustable back plates. We’ve done an article on the 10 best Glock 19 holsters. Give it a read. More specifically the Glock 30S is a lightweight subcompact that packs a punch. It’s total weight is 30.16 ounces and it fires .45 caliber rounds. Its size makes it ideal for concealing under clothes. I added Glock 26 to list because this was Glocks first subcompact. Dubbed the “baby Glock” this handgun revolutionized handgun size and design. Like the 19 and 17 the Glock 26 carries 9mm rounds. It is a popular handgun with law enforcement. This gun is small but can still hang with larger models on market. Click here for our top ten Glock 26 holsters. These are only a handful of some of the amazing compact handguns Glock offers. The company is all about creating products that anyone no matter size and build can use with confidence. This is why Glock has remained on top throughout their 30 year history.